An oncology massage therapist is trained to understand the changes that come with cancer. I know how to modify the massage to cause no harm while addressing key areas of relief: emotional (anxiety and depression) or physical (fatigue, nausea and pain). What is the thought process and major considerations behind administering a cancer support massage? I ask many questions because I want to get a clear picture of where you are in your journey and what to change or add. Where are you in treatment? Have you just been diagnosed and need anxiety relief or are you deep into treatment? Do you have a tumor site? Massage is never done on or around the tumor. Knowing how thin your blood is will tell me how much pressure I can use safely. I use a 1-5 scale: 1 is extremely light (gentle fascial work and holding), 2 is similar to applying lotion very softly, up to 5 which is deep; affecting muscle tissue, which in my experience I’ve never massaged a person that deeply who is undergoing treatment. Do you have a device such as a PICC or port-o-cath? I make a towel ‘nest’ for it so you can lay comfortably prone. Else I will modify your session to side-lying. Have you had an organ(s) removed? I can incorporate trigger point work along that organ’s acupressure meridian into the massage. Scar tissue work and/or lymphatic drainage therapy can be helpful. I won’t apply more than 3 minutes of deeper pressure on that quadrant of your body. Lymphatic work is indicated here because you’ve had lymph nodes removed along with the breast tissue. Lymph is never moved toward an area where nodes have been removed. Instead, I move the lymph along a pathway such that uncompromised areas can process the protein-rich fluid. You should wait the recommended 3 days after receiving chemotherapy before getting a massage treatment so the chemo agent stays in your body long enough to do its job. What agents are you getting? I may wear gloves if agents such as Thiotepa and Cyclophosphimide have been administered. Are you on any steroid medications? Steroids weaken the surface tension of water which means your skin may be more fragile. I’m mindful of pressure once again and of using certain lotions/oils that could irritate your skin. If you’ve had lymph nodes removed, you are at risk. If your doctor has told you no blood draws or pressure cuffs on a certain limb, I position the limb so it’s supported and not hanging off the table. No deep pressure to the affected limb. Are you receiving radiation? External beam or internal beam? Implants? The radiation will make your skin more sensitive so I will avoid the direct beam area. Sometimes, only specific hospital-administered lotions can be used when receiving radiation. If you have implants and they are still active, this is a case by case situation. For instance, if your therapist is pregnant, she could not see you and would need to refer you because you are considered ‘hot’. If they are inactive, no advanced precautions are necessary. Has there been bone or spine metastasis? If so, you will experience no jostling during the massage and very light pressure to protect and not compromise fragile bones. Are you experiencing any side effects like neuropathy? Light pressure here. Another therapist told me she is seeing success with using THC-infused oils to alleviate neuropathy pain. 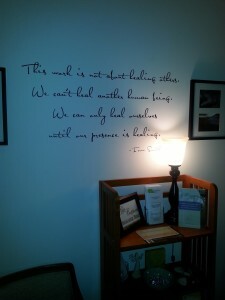 What is my perspective as a Cancer Support Massage Therapist? In the last 10 years, I’ve seen more people using complementary therapies, such as massage, and traditional healthcare providers realizing the positive impact of oncology massage. Most palliative care providers are already aware because they have the experience of working alongside us. I see adults and children and would like to call your attention to a non-profit organization called Lucy’s Love Bus (lucyslovebus.org). If you know of a family who has a child with cancer, please tell them about this valuable resource. In the next newsletter, I will discuss what manual lymphatic drainage is and how it can be used for many conditions besides lymphedema such as migraines and auto immune diseases. Massage therapy is an investment in your well-being, not just blood circulation/cortisol reduction/endorphin release, etc. I’ve witnessed its benefits go much deeper than what studies can prove. I’m delighted to take you on your personal journey with the oldest form of healing we know, healing touch. September is Recovery Month so I’m dedicating this newsletter to a brief overview of how massage therapy can be used in the recovery process. I’ve been working with this population since June 2015 with patients at a recovery center in both their detox and residential programs. I offer massage at my private office to support life long recovery. I use different non-talk bodywork therapies to decrease pain and agitation, release beta-endorphins, and improve sleep. A medical detox is prescribed for heavy users who would experience the most acute withdrawal symptoms. If you are experiencing withdrawal, I focus on bringing awareness back to your body and emotionally attaching you to your body again with soothing massage that doesn’t ask the body to do anything (unlike a deep, rigorous massage). Addiction at heart is about self-soothing and massage therapy creates a pathway to bring the emotions back to the body where pain often is. From what I’ve learned, when one abandons their addiction, their ‘self’ separates into pieces. Maureen Schwer, NMD sums this up: “The spirit is who we really are. Our mind is our thinking brain, and our body houses this. If you’re an addict, you often have to ignore your body, because you are, in essence, hurting your ‘house’.” This is why bringing you back into your body is so important – it’s one of the first steps towards mindful action and self awareness so that when you are no longer physically addicted, you’ve practiced being with your self and feeling your body again mindfully. Relaxation massage and lymphatic drainage massage are good treatment options at this stage because the brain is looking for that fix to be soothed and comforted. When we feel safe, we can remain aware and open and mindful. Additionally, it’s necessary to have a break from the interactive talk therapies that are part of any recovery program. Rather than being asked to do something once more or think of yourself and your addiction once again, the massage is a time-out for you to connect all that therapy on a non-talk, cellular level and gain insights. The peace and clarity can then be taken back to the treatment program to deepen the therapy with the many clinicians, counselors, etc. Deep tissue massage, trigger point therapy and very often fascial release therapy are very good at this stage because they flush your system. Also, one of the biggest benefits of massage is the change in hormone levels that can be measured after a massage session: dopamine and serotonin increase while cortisol, a stress hormone, decreases (by as much as 33%). After dedicated help, receiving integrated bodywork therapies can be an important coping resource. The emotional, physical and situational stressors of everyday life can easily make a former user want to escape again. Massage should be a complementary therapy to any recovery program to assist abstinence. What is MLD (Manual Lymphatic Drainage) massage? MLD is a specialized form of massage that moves the lymphatic fluid back into the circulatory system. Helps post traumatic edema: sports injuries, bruising, whiplash, sprains, tinnitus, and migraine headaches. Has an analgesic component and pain blocking effect while being deeply relaxing so it’s also indicated for chronic pain syndromes (chronic fatigue syndrome) and autoimmune disorders (fibromyalgia, rheumatoid arthritis). Helps to move the fluid if you’ve had any change to your lymphatic system, such as node(s) removed due to cancer or compromised from radiation. Used as a treatment for post-surgical swelling and scar reduction. Is gentle and light (1-2 on a pressure scale of 5 being very deep). Extremely soothing and calming. The lymph system moves metabolic proteins, fat, water, and large molecules between cells back to the cardiovascular system. This fluid is a protein-rich micro filtrate of our blood plasma. Unlike the heart muscle pumping blood (7000 liters daily) around the body, the lymph system (2.5 liters daily) uses no pump. The fluid moves one way via pressure drops along lymph capillaries in conjunction with blood capillaries. Exercising is the best way to move lymph fluid. Using a rebounder regularly may be excellent too. What makes up the lymphatic system? The lymphatic system is made up of lymph nodes, lymph vessels, thymus, spleen, lymphocytes, peyers patches (in the small intestine), and tonsils. The largest well of lymph is in a reservoir located in front of our lumbar spine called the cisterna chyle which drains directly into the left thoracic duct (the hollow above the left clavicle). In fact, 3/4 of the lymph in the body returns to the cardio system via the left thoracic duct. The remaining 1/4 drains into the right subclavian vein. We have between 600-700 lymph nodes in our bodies. Most nodes are in the abdomen but many are also in the head, neck, armpits, and groin areas. You cannot feel most of your nodes because they are in fatty tissue. If you are very lean, occasionally a node can be palpated in the groin area. In general, if you can feel a node for more than 60 days, the medical community suspects it for pathology. Lymph nodes are mini refining stations. Each node isolates and breaks down dead cells, cancer cells, bacteria, microbes, and any foreign cells from further progressing. Recycle and refine to ensure bacteria and malignant cells don’t progress. Produce or trigger lymphocytes, white blood cells. Important to fight infection. Regulate the protein/water concentration in the lymph fluid. This protein from metabolic waste processing (not dietary protein) is what sets lymphedema apart from plain edema (such as swelling from a sprained ankle). It’s an accumulation of protein rich interstitial fluid that has pooled. Most lymphedema has no known cause/origin and is attributed to poor lymphatic plumbing which some people are born with unfortunately. In tropical countries, certain mosquito or fly-borne diseases (filariasis) can infect the blood and lymph vessels. If you’ve had lymph nodes removed due to cancer surgery or compromised from radiation treatment, you could be at risk to develop lymphedema. The affected limb will often feel heavy and sluggish. Your doctor will tell you no blood pressure cuffs or blood draws on the affected limb to keep risk down. Don’t wear tight bracelets or socks that would leave an indentation. *I have completed more advanced training on how to specifically support breast cancer rehabilitation using MLD post-surgery (mastectomies and/or ALND/SLND, axillary web syndrome, fibrosis from radiation treatment). If you know of anyone that may benefit from this therapy, please refer them to me. Thank you! March 6th is World Lymphedema Day. As a certified manual lymphatic drainage therapist I want to help spread the word about lympedema, what it is and how you can get assistance. Boston’s Zakim Bridge will recognize WLD on March 6, 2018. The iconic landmark that overlooks part of downtown Boston and Boston Harbor will be lit up in teal on March 6th, 2018 to recognize World Lymphedema Day. 1. Lymph • edema (lim – fa – DEE – ma) is chronic swelling (edema) caused by a build up of fluid (lymph) that occurs when the lymphatic system is either faulty or damaged. There is no cure for lymphedema, but it can be effectively treated. 2. The Lymphedema Treatment Act (LTA) is a federal bill that aims to improve insurance coverage for the medically necessary, doctor-prescribed compression supplies that are the cornerstone of lymphedema treatment. 3. An estimated 3-5 million Americans suffer from lymphedema — including many that are undiagnosed or undertreated. That is more than ALS, Cystic Fibrosis, Multiple Sclerosis, Muscular Dystrophy, and Parkinson’s Disease combined. 4. Most physicians in the United States are taught about the lymphatic system for 1 hour or less during their 4 years of medical school training. 5. There is no known cure for lymphedema, but it can be effectively treated. Compression therapy is the most critical component of treatment. Without it, patients are at increased risk for complications and disability. 6. Medicare, and many private insurance policies do NOT cover compression garments, wraps, or bandages — the supplies needed for compression therapy.